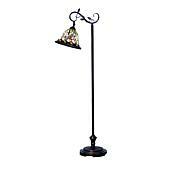 This creative lamp has an exotic look that is reminiscent of faraway lands, right in your own home. 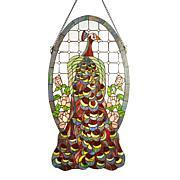 A medley of peacock-inspired colors, shapes and textures makes it a lovely addition to any room of your home or office. 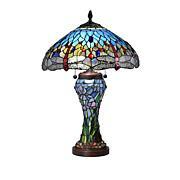 Both functional lighting and colorful work of art, this Royal Peacock Tiffany-Style Table Lamp is destined to be the focal point of your décor. A fine quality lamp; better than some of my other stained glass lamps. Very beautiful. It makes me happy each day to admire it, and the cat enjoys sleeping under its warm glow. Get it! Looks great on my desk. 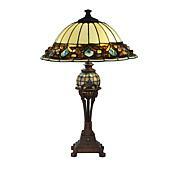 I have several Tiffany style lamps and this lamp is one of my favorites. Received my lamp the other day, packaging, was in near perfect condition, so far so good. However, after assembling the lamp, I realized something wasn't right. First issue one of the light bulbs in the lamp was touching the lampshade, secondly I noticed the base and the post/arms are offset from each other, and finally the lamp shade was missing some patina along the bottom of the shade. It's still very pretty, only paid $89.00 for it. I have yet to decided if I'll return it.